At TechSmith, we’ve helped customers publish over a hundred million videos over the last decade using our desktop products Camtasia, Snagit, and Jing. We have helped our customers share videos to their storage destination, and learned a lot in the process. Many of our customers place content in learning management systems, knowledge bases, and self-hosted solutions specific to their company or institution. But a large number rely on individually accessible cloud platforms, primarily online video platforms (OVPs). 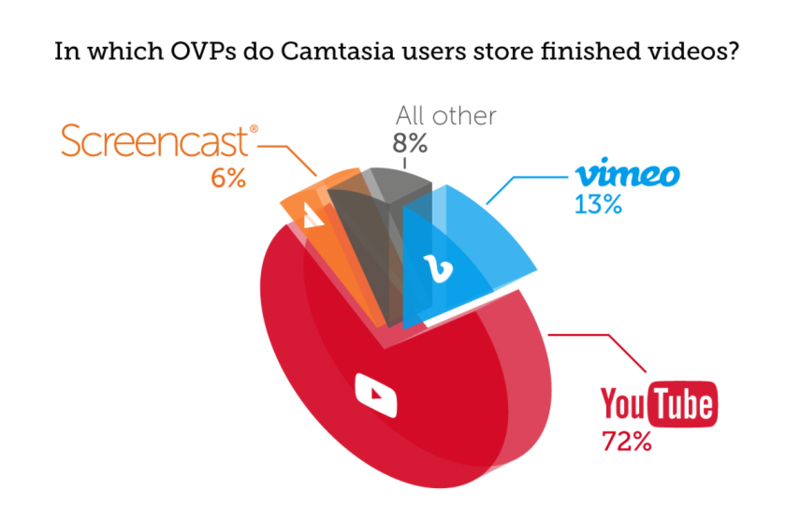 Our customers’ three most popular OVPs are YouTube, Vimeo, and Screencast™, with YouTube by far being the most popular. In the last year, Camtasia users alone have published over one million videos directly to YouTube, and we estimate there are tens of millions of videos on YouTube made with Camtasia. Note that ‘All Other’ includes more than 50 other choices ranging from social media sites (Facebook), online course providers (Udemy), cloud storage (Google Drive), and other OVPs (Wistia). It also should be noted that as cloud storage and other platforms invest in video specific features, there is an increasingly grey line between these and OVPs; however, this article is limited to the latter. Next, we will compare feature sets of the three most popular OVPs, emphasizing the differences between free flavors of the platforms as it relates to educational, how-to, and training screencast videos. Screencasts are videos created by recording what is taking place on your computer screen, which is the primary use cases of TechSmith customers. Unless specified, all functionality statements refer to the free versions – “Vimeo” refers to the free Vimeo Basic plan. “Screencast” refers to the free Screencast™. What free online video platform is right for my screencasts? Screencast is the only platform that does not include any third-party advertising at all. Vimeo does not have pre-roll, post-roll or overlay ads within videos. However, Vimeo does have third party advertising in the form of banner ads on Basic and Plus member pages (removed with a PRO plan at $240/yr), which can be a barrier for some not-for-profit, government, and educational customers. All three platforms advertise their own brand to consumers, Screencast and Vimeo provide additional custom branding control at a paid level, and Vimeo providing the most branding control. YouTube is loaded with third party advertising – pre-roll, mid-roll, banner ads, search ads, homepage banner ads, and in-video text-overlay ads. It is also known for the ‘rabbit hole’ of serving up a continuous stream of videos to your audience based on that consumer’s search history, often including competitor videos. It is currently possible to turn off some kinds of ads (you must disable monetization, as well as have no copyrighted material within your video). By doing this, you will not be allowed to have in-video links to any external website (though you still can use links in the video description). However, there is no guaranteed way to make your videos completely advertising free. Of course, the benefit of an advertising platform is that YouTube allows you to monetize your original content videos by running ads on them. If ad monetization is your goal, then YouTube is the only option. Your video will need to reach a pretty high threshold of watch hours and subscribers to be eligible for their Partner program. YouTube’s community comprises over 1 billion users. They provide expert advice, and even physical filming spaces to help creators grow an audience. They also have the best SEO optimization and localization accessing 95% of the world’s internet population, but be aware that there are still a handful of countries that block YouTube. YouTube also offers the best free analytics including traffic sources, gender, devices, and audience retention. It’s the #2 most visited website per Alexa with nearly 3 million sites linking to it. With that large of a community comes risks. YouTube is associated with unprofessional, even offensive comments from trolls and spammers. Vimeo by contrast has a smaller, moderated, supportive community that is attracted to higher quality content characterized by artistry, film making, and music. It has about 170 million viewers, 70% international, and is a top 100 most visited site on Alexa with close to a half million sites linking to it. Vimeo offers some basic analytics including plays, finishes, and comments, with additional analytics in paid plans. Screencast does not have the advantage of a built-in community or marketplace. Screencast customers are typically self-marketing and distributing videos by embedding links on websites, social media, knowledge bases or via email. Screencast folders marked Public are indexed by Google. Screencast itself provides limited analytics today, such as number of views and comments. Screencast also provides an integration with Google Analytics, providing real time traffic information, as well as historical data. You can view demographics, geographic location, traffic sources, and how many people finished watching your videos. Its Alexa US rank is about 2200, with over 14 thousand sites linking to it. Vimeo does not permit commercial content and shuts down violating accounts. Further, Vimeo specifically lists “product demo and tutorials” as forbidden content, which unfortunately is a top use case for TechSmith customers. Vimeo requires “businesses” to enter at the PRO level ($240/yr) and this is the same level of subscription required for content monetization. See Vimeo’s commercial content guidelines for further clarification and exceptions. YouTube and Screencast do not place limitations on commercial content. Screencast does not directly assist with selling content, but doing so (e.g. selling password protected links) is permitted in TechSmith’s terms and conditions. YouTube has recently phased out some direct paid content support, but indirectly supports it. In a recent change to retention policy, content in free Screencast accounts is deleted if inactive (not viewed) for one year. Many TechSmith customers leverage free Screencast just for the academic school year, for peer review or collaboration, or for one-time sharing of deliverables with customers or coworkers. In these cases, the automatic deletion is helpful to free up space in the account. An upgrade to Screencast Pro ($99/yr) is required for indefinite storage. Also note that TechSmith has introduced a product for video review as another paid option for review with indefinite storage. Vimeo and YouTube store content indefinitely. If you use Vimeo or Screencast paid accounts and later change your mind and downgrade to free accounts, some of your content may eventually be deleted. This is not a risk on YouTube, so consider your long-term intent. Screencast retains and distributes the original source video file uploaded. By contrast, both Vimeo and YouTube delete the original source version of the video uploaded, and replace it with lower resolution flavors to save on storage costs, as well as to optimize for multiple types of delivery scenarios. Lower resolution versions often provide a better viewing experience for consumers (e.g. less buffering). This is particularly true for large videos consumed over low-bandwidth connections; this is not an issue for Screencast customers with use cases targeting consumers in business or high-bandwidth environments. In addition, this kind of re-encoding is necessary to support consumption on certain specialized device types like Roku or Xbox; these are unsupported by Screencast. Unfortunately, re-encoding screencast videos effectively is challenging. Currently, the compression that comes along with re-encoding video for low-bandwidth environments leads to blurry text. It is especially apparent with text on buttons, recordings of bulleted PowerPoint slides and added text annotations- rendering the video ineffective for educational use. This problem is less of a concern for the type of content found on Vimeo and YouTube, which consists mostly of real world or simulated camera shots ranging from more artistic content on Vimeo, to the comedy, music videos, gaming play- throughs, and product reviews found on YouTube. Note that Camtasia specifically optimizes screencast videos to preserve clarity on all three platforms as best as possible, but this works best with Screencast since it retains the source file produced by Camtasia. If you want your consumers to be able to download the video source files for local viewing, only Screencast can support this. Vimeo won’t have video source available for download without an upgrade to PLUS ($84/yr), which also supports high resolution HD video uploads. YouTube also doesn’t have the source file, plus consumers cannot download videos at all (unless the consumer subscribes to YouTube Red ($120/yr) which allows download to mobile devices. YouTube and Screencast support unlisted links such that only users who have the link can see the video. Vimeo does not offer unlisted links (what they refer to as “private”) without an upgrade to Plus ($84/yr) which enables you to hide the video from the Vimeo site. That upgrade brings additional security functionality for embedded videos, such as domain-level privacy (limiting where content can be embedded). Note that if an unlisted link is shared (or posted on social media), then anyone who sees the link can view the video. Due to that risk, passwords might be better for your purpose. Screencast and Vimeo provide capability to password protect videos, YouTube does not. In Vimeo this is done at an individual file level, in Screencast it’s done at the folder or playlist level. Passwords are useful for protecting your intellectual property. All three platforms allow distribution to be limited to named members of the community. This is what YouTube refers to as “private”, Screencast refers to as ‘authenticated’, and Vimeo refers to as ‘only people I choose’. YouTube offers unlimited storage and bandwidth. By default, videos must be shorter than 15 minutes, but this can easily be increased. You never need to worry about additional cost (or problems) if your video goes viral – its top ten videos (9 of which are music videos) have billions of views. Vimeo allows 500 MB per week of video loaded (up to 5 GB total) and unlimited bandwidth. Storage increases with an upgrade to paid plans. Its 10 most popular videos range between 2 million and 75 million views. Screencast offers 2GB of storage and 2GB of monthly bandwidth in its free plan and more with paid plans. Additional Screencast Pro account bandwidth can be purchased. These are the smallest limits of the three platforms. A typical free Screencast account for a Camtasia user contains around 100 pieces of media, or 1,500 pieces of media for a Jing user. Screencast is not intended for viral videos, with the most viewed videos typically having 3-4 million views (we do have one GIF with 30 million views.) TechSmith is currently investing in a significant platform upgrade of Screencast so the scalability and performance will be increasing in 2019. Have you ever uploaded a video, shared the URL, then needed to make a change to the video? Both Vimeo and Screencast allow you to replace a video after it has been uploaded without changing the URL. YouTube does not support replacement of a video with a new version, and it’s one of the biggest challenges for our customers producing technical content like software training screencasts, which often need repeated updates. YouTube does allow you to make limited enhancements after publishing such as color, speed changes, and basic trimming. YouTube used to support limited post-production editing as well via their editor, but have since retired it. Screencast provides advanced player integration with Camtasia interactivity including interactive quizzing and hotspots. These Camtasia features are not supported by the Vimeo or YouTube player. But YouTube, which retired clickable annotations in 2017, does support ‘end screens’ and ‘cards’ for mobile-friendly interactivity. Vimeo offers ability to prompt for email addresses at the Business plan level ($600/yr). Camtasia’s caption editor works with all three platforms. If your video creation tool does not provide captioning, which is becoming increasingly important due to accessibility laws, YouTube and paid Screencast provides a caption editor as well. Vimeo does not provide a caption editor, but provides integrations with paid third-party captioning services. Do I have copyrighted content in my video? YouTube has automated functionality to detect and turn off videos with copyrighted content. Sometimes videos are mechanically flagged for copyright infringement without a clear explanation, and our customers don’t agree with the automated analysis (or have purchased rights to the image or music already) and become frustrated with a lack of response from YouTube customer service. Also note that the owner of the copyrighted content can choose to advertise on your video. Vimeo reviews and removes content that “rips off movies, music, television or any other third party copyrighted material.” Screencast removes violating content based on take down requests. Do I need to store other media (or file) types? There are situations where it’s inconvenient to use different repositories for images than videos. Both types of digital media content may be produced by the same creator, using the same tool (such as Snagit or Jing) and links embedded in the same output (e.g., Zendesk, online course platform) for use by the same consumer. This is especially true for support, documentation and training content. Screencast is the only platform of the three that also supports images (as well as other content) making it a useful one-repository solution in these cases. Some customers also use Screencast for podcast storage. Is customer service important to my success? YouTube largely relies on a customer forum for support of its masses of users, and is not known for responsive customer service outside of its Partner program. Vimeo provides a three-day response time via email. Screencast provides a one-day response via email as well as a monitored customer forum. Vimeo provides faster email response time at the paid level, but does not provide phone support and only provides chat support for live streaming events at the Premium ($900/yr) level. Screencast offers phone support at the Pro ($99/yr) level in addition to chat and email. We hope that analysis of screencast hosting solutions is helpful. Thanks for reading, and please leave a comment if you’ve found this valuable or have any questions for us.